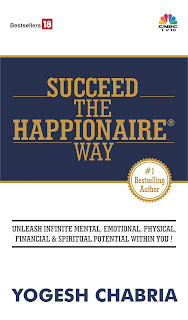 Yogesh Chabria - The Happionaire ​Blog - Best Motivational Speakers In India - Inspiration, Success: Do Things That You Are Told Not To Do! Do Things That You Are Told Not To Do! Over the years, I have realized that the best way to create wealth and invest smartly is to not listen to what people around you are saying. It goes all the way back to even before I started investing. I was told not to invest in the stock markets because it is gambling and almost everybody loses money. It is gambling only for those who invest without knowledge, guidance and based on hot tips and such people do end up losing money. For me it has been one of the best blessings in life. When I started investing, I was told by brokers and other players to indulge in day trading and futures and options trading. I did try it and ended up losing money. Thankfully, I could afford the losses I made. It taught me a lesson never to listen and follow random people. Following Dhirubhai Ambani, Sunil Mittal or Laxmi Mittal make sense – but following your orthodontist when it comes to investing or business is a bit silly. At the peak of the recent stock market crash, I bought while some of the largest Mutual Fund Managers and TV analysts were selling and talking about doom. We all know what happened. It was the same story with Gold. Of course gold has rewarded investors more in dollar terms than rupee terms, but the main spurt in gold is yet to come. Everybody will be surprised by it. Throughout life, I have realized that whenever I asked someone for advice they usually told me not to do it. It is too risky. Steel, cement, autos, power all were sectors which I invested in even though people told me not to invest in them. I have realized that the best way to invest most of the times is when everybody else discourages you from investing. This means that most others have still not realized the potential and the opportunity available. How many people were buying companies like LIC Housing Finance or Jindal Steel and Power barely ten months ago? Today Jindal Steel and Power has rewarded investors over 700% while LIC Housing Finance has rewarded investors over 370%. Now does it make sense to run behind power IPOs today or run after Jindal Steel and Power at these levels? I would go after new investments which have been ignored by the masses, because once again there is a possibility of extra ordinary returns. Today a stock like Infosys can not make you several crores, if you were to invest only a couple of lakhs. Two decades ago it would have. Yesterday I was looking at the balance sheet of a company that can easily reward investors 500%-600% in the coming 2-3 years simply based on fundamentals. Still almost no Mutual Fund, Hedge Fund or Private Investors have noticed it. In fact most of them have discarded it, because they find it more exciting to run behind what is considered ‘hot’. Anyone who is investing below Rs. 15 – 20 crores can easily benefit from such opportunities. I do understand that for a Mutual Fund having Rs. 20,000 crores it becomes extremely hard to give the type of returns I am talking about. If the entire company is worth only Rs. 200 crores, how on earth will they invest anything that makes a sizeable difference? At this moment stay away from the Sensex – only look at hidden gems. There still are a few. Life always gives us opportunities; it is up to us to make the most of them. Over the years I have seen the financial state of people change simply because they made the right investment decisions. Financial Technologies, Pantaloons, Bharti (Airtel) , Sesa Goa and so many others are all examples of companies that have created immense wealth for investors at one point or the other. Some of them have multiplied investor wealth by over 50 times. If we go back in time, I can guarantee you that people who bought them right in the beginning must surely have been discouraged and de-motivated by everybody around them. The next time someone de-motivates you about doing something and tells you not to do something. Think once again. It might just be the thing that will change your life forever! Very inspiring and well put. Power is surely overvalued at these levels. Jindal Power was good at those levels - no longer. Curious to know which this company is. It is getting difficult for me to sleep tonight. I am searching the stock without clue. Kripa kijiye .Please help me boss. Sincere Student( will be a happionaire). Very inspiring and hidden message comes with this post. Gold will surely reward but it might take some time. Keep your self away from Sensex and look for gems. you are honestly guiding all your followers in a rite direction and we all will mend good money in coming years. Thanks to you for motivating evryone. Every time I read this post it gives me a powerful message. I did not follow your guidance and missed the bus when you were talking about the Cash The Crash philosophy. I missed Gold too because I was too lazy. But now I have realized my mistake and want to invest with you. Please let me know how I can do this. I have also sent you an e-mail. This is true not just for investing but everything else we do in life. Excellent views and a must read for everyone. As others have said there is always more to what is written and filled with hidden messages. When I look back and read your earlier posts (from a year ago) I realize how many hints you shared that if someone was smart enough could easily make good money. But the problem is with me that I still am starting and need more time to learn. I hope to do that soon with your blessings, support and excellent service to the investor community in India. Excellent and very touching. Also I guess the correction as mentioned has started. Can you please guide us for gold moment. it touched 1070 USD in new york but we dint made that high i guess because of dollar getting weak for rupee......... and now dollar getting strong and gold coming down.... and you please explain how the working of crude, gold and forex works. Yogeshji ... good Post, same was in my case when I decided to invest in markets, but i am glad that I followed my heart and I dont regret it. Sir I just have one question for you do u still belive in the company that u have shared in "Retail and Real Estate Play". Wouldnt it be WISER for all the people to NOT TO INVEST IN GOLD because they have been getting the suggestions to INVEST IN IT.. I would not listen to Yogesh ji, if he was going to give medical advice or dental advice. But when it comes to investing, he is someone I trust fully. Had I not followed him, I would have lost quite a lot by not investing at the peak of the crash and listening to brokers and tv loud mouths. Investing in Gold itself has helped me as I bought it around $ 800 - now it has crossed $ 1000. Please share this company and let me know if there is someway where i can invest in your fund. I don't have lot of money, but please help. Your fan and like others have also invested in Gold. I have benefited a lot by following you Chabria ji. Every post of yours if fillied with secret messages, I feel and there is a need to read between the lines. Your simple words of "the sensex being over valued and to look for hidden gems." is priceless as we can see markets crash after your warnings. May the Happionaire way spread to everybody in our nation. IMF sells 200 tonnes of gold to RBI. I was so happy to know that the RBI too has started listening to Chabria ji's very correct suggestions. If dollar falls, India will lose lot of money. We should convert all our dollars to Gold. It is a real honour for me to be in company of such intelligent people here and thanks for posting this news Patel bhai. I am in UK and get most of my business news here.